Is Performance Management an Important Component of Talent Management? 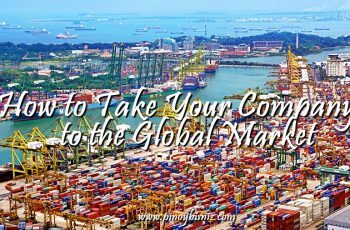 Being in a business that relies on manpower for profit, no company serious in its endeavors will overlook the very same thing for its being in business. In a company, this may entail stringent monitoring of each and every employee’s performance or as a collective group. While a policy such as this may sound so strict and demanding, the imposed rule has something to do in setting a balance between an individual’s personal goals and that of the organizational goals which, if left unchecked, might not meet as they’re different. 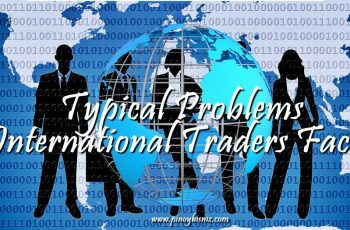 Defined as the discrepancy between desired and actual results, the term “performance problem” is coined to name a performance-based issue that is, while appearing at the time, unnamed. In its identification, another concept is also formed which is meant to address the very same problem that led to its very creation—performance management. The concept of “performance management” did not into use until around the late 1970s, a time when the need to manage and enhance a human behavior towards a particular result has an absent term. In a nutshell, performance management implies that the quality of an employee’s performance may directly correlate the level of interventions applied towards the person’s attitude. In the context of the collective group of people, performance management is also defined as the strategic and structured approach which results to a favorable outcome by underpinning the importance of focusing on the people significant to the pursuit (Armstrong and Baron, 1998). In a company setting, this suggests the individual worker, the team, or the organization as a whole. Intuitively enough, the use of performance management as a concept mostly applies in the professional sector where certain actions have financial ramifications. But placed in the context where finance is not involved, performance management serves as a benchmark meant as a reference for improving upon people’s performance such as in sports, NGO programs, school, or literally any other group which concerns interacting people. Commitment analysis consists of a mission statement tailored for a job or process, inclusive of the product, scope, and purpose. In this part of the performance management as well are the list of key objectives commensurate with their own performance standards. Following the commitment analysis is the work analysis. In this step, the job description and reporting structure are found. Lastly, there are the performance standards which comes alongside expectations which aim to measure both the efficiency and effectiveness of the work. Properly imposed for its intended ideals, an employee whose performance is carefully monitored and optimized for the job exhibits a relative boost in his performance which easily translates to better productivity and subsequently better revenue for the company. There are only three steps that was stated and these are Job Analysis, Work Analysis, and defining the Performance Standards. These three steps onoy talks about the job descriptions, job objectives and the expectation of the company towards the employees. To achieve effective performance management we muat also consider the steps that we will do to ensure that employees will have a stable performance and these are implementing performance coaching and letting go of employees once they are already doing poor performance. In implementing performance coaching, we can do team building or counseling towards the employees. Lastly, recognizing employee achievements is important and as well as letting the employees to give their feedbacks towards the company. In this way, the employees could perform well since tgey know that they can be an asset to the company. There are three steps mentioned in the article are Commitment Analysis, Work Analysis and Defining Performance Standard. The way I understand “Commitment Analysis” is more on answering, How committed the employees are in delivering what is being required to the best ability they have? This measures the intensity of the employees to deliver the results aligning themselves to organization objectives and goals. In addition, this measures also how devoted and dedicated the employees are in doing the task provided to them. However, in contrary to its purpose, the results may vary based on the responses of the employees in conducting this type of analysis. Yet, very useful to the organization for them to identify the opportunities that they need to address. Second is Work Analysis, to established performance, our employee’s needs to know the extent of their responsibility and duties in performing their tasks. Once identified and structured, we can then measure how good their performance is based from the results they delivered. In addition, this will evenly distribute the tasks and provide specifications to identified individuals fitted to the expertise they have. Last is Defining Performance Standard. Once Duties are performed according to the organizational objective, it is always IMPORTANT and NECESSARY that an organization must set specific standards to maintain an outstanding performance. This simply means that Standard will define if certain expectations, goal and target were achieved. This process will also address potential issues towards hitting the organization objective. Everything has been mentioned except from goal setting. Goal setting is a very important step in performance management since it sets the purpose of standards and objectives to the employees. Its a clearer picture as to what needs to be done and what has been accomplished. Performance management help the organization in planning, developing, and continuously improving performances to reach organization goals. It is expected that employees should exceed what is expected of him to deliver quality performance according to the company’s standard. I think couching was not mentioned in this article. Couching is a continuous effort that encourage employees to become better. New skills will be develop by effective couching because the employee will receive proper training and higher job satisfaction. Employee satisfaction results to positive behavior and motivation to do more what is expected of him. An effective couching includes creating a good working environment for workers to have a friendly competition like role-playing of positive behaviors and making fun at work. Turnover will also be reduced. Aside from Commitment Analysis, Work Analysis, and Defining Performance Standards, I think one of the missing steps of performance management is Coherent Assessment. This step must be done next to defining performance standard. As performance standard talks about the expectations which aim to measure the efficiency and effectiveness of the work, thus, coherent assessment should be conducted. Coherent Assessment would assess if the performance standards were met. This is an evaluation that might be conducted weekly or monthly by the talent managers ensuring that the works were performed properly as expected. Talent managers should provide evaluation forms for the workers so that they will be guided on how they perform on their work. Evaluation forms contain criteria, guidelines that set the expectations of the manager toward his/her worker. I could further say that this step of performance management is very important because I experience this in the company where I currently work in. Twice a year, we, the employees were evaluated by our managers through observations. After observation, the manager would talk to us and give us some feedback on the things we performed well and on the things that we need to improve. Through this, we’re able to grasp ideas from the advice we get from our manager and we’re able to improve our performance especially on the areas where we are weak at. Lastly, one important step of performance management that must be done also is the Constant Check-up of Workers. This has something to do with the efficiency aspect of the employees. Employees should always be asked how they are on their assigned tasks. They should be asked always what are their concerns and worries and managers should provide probable solutions for them. Through this, performance will be boost and the company will become more successful. Performance Management is about working with employees in identifying strengths and weaknesses in their performance and help them to be more productive and effective. 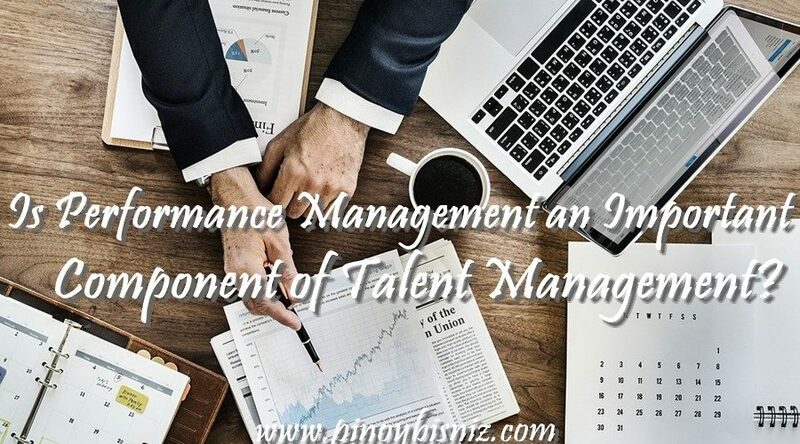 The article “Performance Management as a key component of Talent Management” revealed three (3) steps of Performance Management namely: Commitment Analysis, Work Analysis and Defining Performance Standards. 1. Evaluation of current performance system – this process helps the company check if the current system is indeed applicable or effective, if it needs to be changed pr developed further. 2. Identifying the organizational goals – through Performancw Management, employee will be able to know and engage themselves in reaching the company’s goals. 3. Setting performance expectations – expectation setting from both employee/staff and the management/superior is very important. Included in the goal setting os the feedbacking regarding employee’s strength and weaknesses. With this, heads are able to help their subordinate improve their performance and help in reaching the goal of the company. 4. Monitoring and developing performance throughout the year – usually, performance management is done once a year to check if employees are able to reach their and the company’s set goals. 5. Evaluation of employees’performance proper – in this step, heads play an important role. Objectivity is the game. Heads are to provide feedback regarding the employee’s performance, consequences, rewarda and etc. 6. Setting new performance expectations for the next year – discussion between heada and staff comes in. Both should agree and align their expectations or target with the goals of the company. 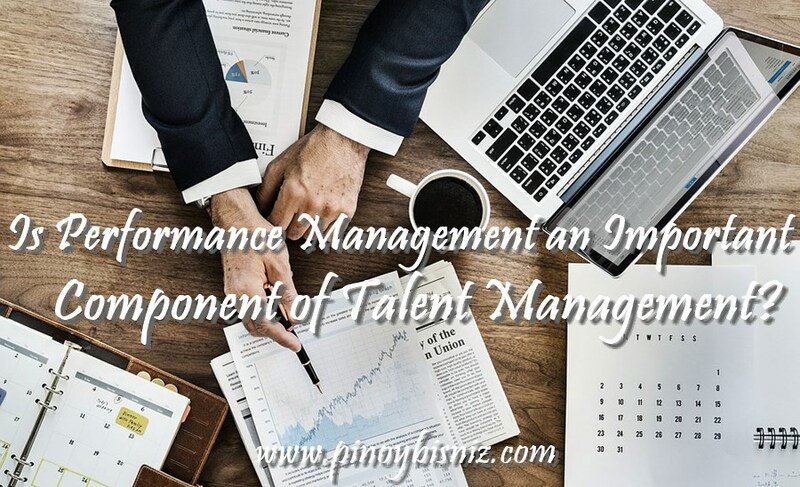 The article states broad components of talent management focusing on performance management, but what composes the said management. Performance management deals with the overall performance of an individual or employee toward the department, company and work station. As I also research it states Performance Management as a term used to describe the process set by an organization to ensure all employees are aware of the level of performance expected of them in that role, as well as any individual objectives they will need to achieve to achieve overall organizational objectives. Aside from what is stated in the article, I believe it should also add on the meetings, checking and trainings could actually be a great help and to let them breath and recall old and update new skills, knowledge and ideas. Knowing the weakness of a certain employee is actually good for both the company and for the individual, learning to identify and do seminars that could actually lead to effective behavior, effective performance and achieving business targets. On a positive note, Proper and correct salary increase and incentives and bonuses is actually one of the reasons they continue to perform their job well. Remuneration and awards could also affect the performance of the employees, sometimes managers tend to forget to have a little gratitude to the lower level for a job well done, a trophy, certificate and even a verbal encouragement could actually a motivator for them to fully give the best of their capability knowing that all their hard work are acknowledge and properly compensated. I think the missing step in performance management was Develop the potential and opportunities of the worker to be learn new thing and recommend them to conduct, attend workshop, send to school for the company growth. If we know the commitment of the worker, the quality and quantity of work and the performance of the workers, we can recommend them to do further studies in order to apply in the company the learning that they me get in their far their studies. Because when give the worker, the opportunity to learn they can help the company achieving the goals. That’s why it is important to develop the potential of the workers. I think, monitoring and developing employees’ performance frequently, giving one on one feedback, and setting new performance expectations for the next year are the missing steps of performance management. As employees begin to work on their performance, the organization should keep an eye on how the employees’ are doing. The organization should give praise to the employees where performance is strong. If the employee appear to be struggling to meet performance expectations, the organization should talk to them or do coaching. The organization should also re-examine the goals for the upcoming year. Understanding or identifying the steps of the performance management can help the organization work to their full potential. The steps of Performance Management mentioned above are broad yet inclusive of other details when it comes to this matter. There are minor details that may or may not be included in the steps above, where I believe is worth mentioning. After defining performance standards to employees, I believe, Monitoring of Performance should follow. This is to check whether standards are carefully observed and followed. Talent Managers through the department head or through those who directly supervise the employees are the ones who will carefully monitor the performance of each employee. Monitoring performances will be helpful to prevent possible performance problem. If problems cannot be prevented, monitoring will be able to find solutions early on within the process. Mistakes can also be corrected when monitoring performance is done. In the course of monitoring, when problems arise, it is best to implement a Discussion on Challenges and Difficulties encountered. Employees should be given a venue to express the hardships they experienced while discharging their responsibilities. During this step, not only difficulties and challenges are discussed but also suggestions on how to make their work easy, effective, and efficient. When the discussion is done, Developing a Training Portfolio might be needed. It might be, that there will be a need to develop a training portfolio for certain needs or phase of the business process, especially for newly hired employees. A retraining or refresher course might be needed for employees who may have difficulties meeting the performance standards. Performance Evaluation is also a necessary step in Performance Management. At the end of a business cycle say for example a year, it is helpful to evaluate the performance of each employee and see if the goals set were reached. This process will help employees see where they can improve and work harder and also be affirmed on where they are good at. Setting new goals will follow after evaluation. In the evaluation process, there might be a need to align expectation versus reality. When goals are not met, it could be that the standard was set so high without considering factors that could affect its realization. If the goal is met then maybe there is space to do more. Setting new goals is like a refresh button, a chance for some to improve and a challenge for those performing to do more. For me, the suggested steps integrated with those mentioned in the article are important components of Talent Management, because it is measuring the performance of the employees in relation to the overall mission and vision of the company. When performances are properly guided and managed, both employees and the company benefits. There is a sense of fulfillment in the side of employees and company profits from productive and efficient workers. Once the concept of Performance Management has been grasped the next 3 steps are a necessary implementation for the project to succeed. Tailored for a job or process it is vital to instil and assess commitment to a product, a job or objectives! The product, the scope and purpose have to be made clear as well as the job process! It is the first bloc in the Performance Management: clarity of purpose. Vital for understand where a person fits in the overall company structures, the reporting lines and the job description. Without this there can be no clear view of the work, the processes and who to report to. This is where company expectations according to work standards are laid out so one knows exactly what is expected of him/her and the standard he/she will be subjected to and assessed on. Let’s put it that way, without these 3 principles each staff who behave like headless chickens with no sense of purpose or direction! In the long run the company will suffer terribly. Performance management is a system created to all organization to discover the path of successful organizational goals, through appropriate evaluation,assessment and feedback it can lead a healthy work environment. Commitment analysis, work analysis and defining performance standards have a big role to the performance management. These steps of performance management are very important to be observed and utilized. First, Commitment analysis helps you to improve your loyalty and love to the company or institution, gives you a good relationship in the workplace in your organization. Second, Work analysis gives you information about your job and about the work place that you work in or staying and lastly is the defining performance standards, it leads you to have measurement and achieving the effectiveness and efficiency of the performances of employees. Through the Commitment analysis, work analysis and defining performance standards, our organization will lead into improvement if the organization will observe and utilize those three steps of performance management. A talented and skilled workforce is the lifeblood of every organization to effectively and efficiently deliver the required services to its clientele. As the war on talents worldwide escalates, many managers quickly learned the importance of having the right people in the right job. Performance management have different steps which are considered very important in the organizations which yields better business results. Commitment analysis is one of the steps in performance management. It is said that employee commitment can take different forms. It even denotes different meanings that is essential in stabilizing or binding force (mind-set), which directs behaviour.6 In order to show how committed an employee they should feel that they fit in and, feel they understand the goals of the organizations vision and mission. The added value of such employees is that they tend to be more determined in their work, show relatively high productivity and are more proactive in offering their support. On the other hand, work analysis requires activities and responsibilities in determining which tasks employees perform is not easy. Personal qualifications is necessary to determine if the employee is suited to his job, where a personality test can be a basis in determining such. Though, job analysis talks about the job, but not the person doing it, still, we cannot separate the person and his job in making analysis. Based on personal experienced, if the employee does not fit with his/her present job, he/ she will experience fatigue or burnout, resulting to job dissatisfaction, which later leads to resignation. Some of the l factors can be considered such as, knowledge, skills and abilities, work activities and behavior as well as working relationship within the company. Furthermore, defining performance standards of an employee can be a complicated process, since business may fail to achieve a minimum results, on the contrary, it is a key for the employees to maximize their potential. Careful planning is a must, where employers set goals and discuss expectations with the employee. Assessment, as well as feedback about their performance and the opportunities for improvement should be addressed, coupled with career development. Performance Management plays a significant role in the realization of company’s goal; it allows business entity to compete effectively against adversaries by having competitive, skilled, and talented workers. Aside from the aforementioned steps in performance management namely; commitment analysis, work analysis, and defining performance standards; an organization may add the following steps to better improve its performance management process. The first step could be the evaluation of the company’s previous or current performance management process. Sometimes the problem of the company is not really the lack of performance management function but the improper implementation of their already existing function. An organization may decide on how to develop the previous system so that it will align with the need of the company. Secondly, identify the purpose of performance management function. It is imperative for an organization to know what are the goals or vision it wants to accomplish so that the performance management system is aligned to its goals. No matter how effective or good the system is, but if it does not help in the realization of the company’s overall goal then it will be futile. Third, is to conduct survey or feed backing. Commitment analysis, work analysis, and standards are already there; now the focus should be on the feedback whether the said steps are executed and implemented. Feedbacking will allow the company to monitor the progress and impact of its performance management function both to its employees and the organization in general. Also, it will allow them to identify problems and rooms for improvement once the result of the performance management system is identified. And lastly, the organization may consider institutionalizing the performance management system. Once feedback is done and results are positive and effective, the organization may opt to institutionalize the performance management system they have created. 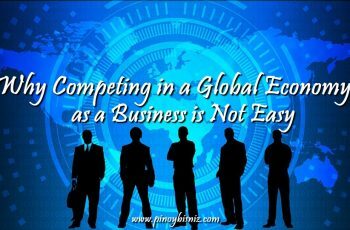 Institutionalizing the said system will allow the business to have a standardized system followed by the company. 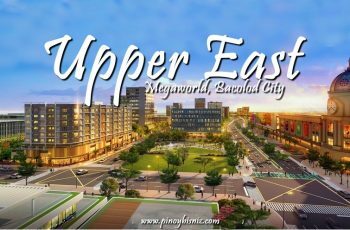 In addition, they may just further improve and develop the said system if there are changes in its environment, goal, and operation so that they may cater changes positively. All of these steps are important considering that war for talent is a global problem. An organization that is proactive by having initiatives on how to manage performance and talented employees will have a competitive advantage against its adversaries. 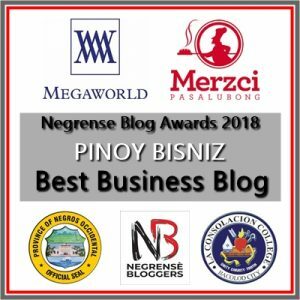 In business nothing is permanent; it is necessary for every business to be one step ahead of its competitor especially in having the best and talented employees. Performance and talent management is not optional, it is a must. Commitment Analysis, Work Analysis and Defining Performance Standards were only three steps of Performance Management mentioned in the article but we know that there are also several steps that could be added to further quantify the employee’s ability to work for the company. As an HR Personnel, another step I could add would be Job Description Development, Ongoing Employee Development and Goal Setting and Feedback. First is Job Description Development – this may be associated with Defining Performance Standards but in order for an employee to perform his/her task well for the company, development of job descriptions for different positions should be specified. 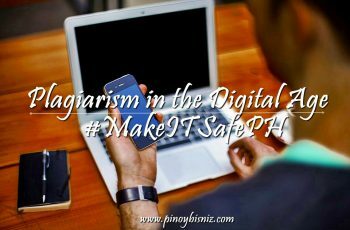 This will also be the basis of an employee, as well as managers/employers, if he/she is performing the tasks assigned to him/her or if they are already doing the tasks that are no longer within the scope of their work. Another step would be Ongoing Employee Development; in this step, top management’s involvement and support is required to be able to provide the employees the needed development that they need to be able to perform their jobs efficiently and effectively. It should be a continuous process to be able to get a top performance of employees for the company’s own benefit. Lastly would be Goal Setting and Feedback as one of the step to achieve quality performance from employees. Companies; through the HR Management Office; should set certain goals for the company and the employees to reach. These goals should be parallel with the company’s and individual employees as well for a harmonious working environment.